The inspiration for Ensemble Offspring’s Lone Hemispheres concert came from one of the new music group’s long-time supporters, Don MacLeod, who has been lobbying Artistic Director and percussionist Claire Edwardes for “more Xenakis”. 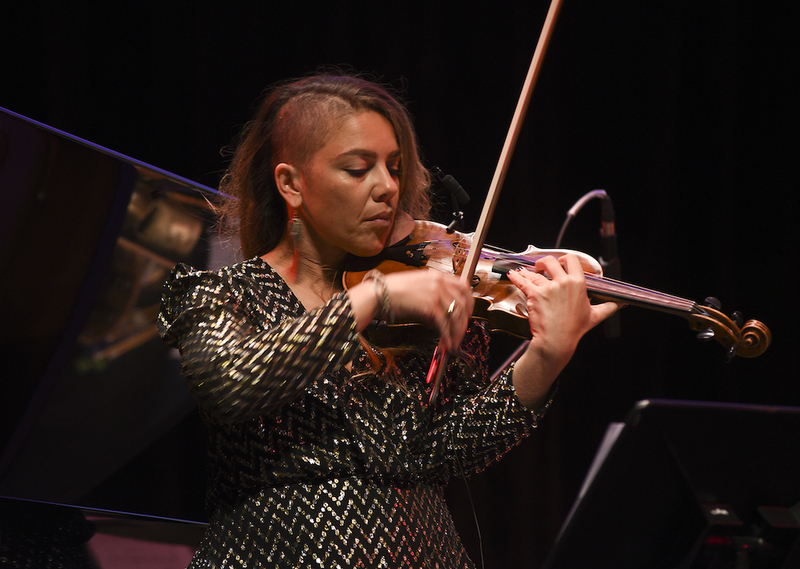 Edwardes delivered at Carriageworks on Tuesday night – along with pianist Zubin Kanga and violinist Véronique Serret, in EO’s penultimate concert for the year, pairing three of the 20th-century master’s work with three new Australian works for (more or less) the same forces. The first half of the concert was given over to the Australians, with the world premiere of Michael Smetanin’s crystalline Four Angels for solo piano opening proceedings. Kanga brought a shimmering lustre to the work (which is dedicated Smetanin’s wife, mother and two daughters) hauntingly offset by the instrument’s lowest octave and a half prepared with rubber erasers, a resonant bass pizzicati. Cathy Milliken’s Crie for violin and solo voice – both performed by Serret – takes its title from the French word to cry out, and is a response in part to the murder of Maltese journalist Daphne Caruana Galizia last year, dedicated “to brave women such as Daphne Caruana Galizia, who have been silenced for speaking out.” Not unlike Damien Ricketson’s opera The Howling Girls earlier this year, Milliken’s work explores the boundary where silence gives way to speech, Serret’s wordless vocalisations mingling with a drone-like violin line, an element of spectral music emerging in the mingling overtones and harmonics as voice and violin brushed against each other. Elizabeth Younan’s quirky Electors of Middlemarch, performed by Edwardes, also combined voice and instrument – though to more humorous effect. Edwardes premiered this work in the Sydney Opera House’s Utzon Room in June this year, but it was even more compelling on the second listen. Edwardes handled the complex relationship between voice (a stammering speech from George Elliot’s novel) and percussion (originally modelled on Xenakis’ Rebonds set-up, but with the notable inclusion of stinging hi-hat), with crisp confidence, the stuttering effects bitingly percussive rather than hesitant. The three Australian works were mirrored on the other side of the program in works by Iannis Xenakis, beginning with the classic 1973 piano piece Evryali. A Le Corbusier-trained architect, who suffered a horrific facial injury fighting in his 20s as part of the Communist resistance in Greece at the end of World War II, Xenakis’ music combines mathematical complexity with visceral power, and in Evryali used branching structures – arborescences, tree-like graphs transformed into music. Their complexity requires the interpreter to choose which branches to follow and which to omit, Kanga using modified version of a realisation by Jonathan Powell. Kanga gave a vibrant performance that captured the work’s percussive energy but also brought out a certain lyricism, the piano’s stormy turbulence given a hazy magic by Kanga’s pedal work. Mikka and Mikka S (composed in 1971 and 1976 respectively) for solo violin evoke the sliding frequencies of an electronic oscillator – almost an air raid siren in Mikka S, which brings together two sliding violin lines – and Serret’s sound buzzed fierce static at the edges while maintaining a vibrant core, the sparse textures echoing Milliken’s Crie in the first half. Edwardes brought the concert to a close with Xenakis’s powerful, ritualistic 1989 work Rebonds. The composer gives the option of performing the work’s two sections AB or BA, and while Edwardes has often opted for reverse order in the past, here she went AB, bringing long-breathed phrases and an effective sense of architecture to the resounding work. While a few tech problems slowed the concert down, this was nonetheless a night of exciting music-making, with a beautiful sense of interweaving relationships linking the new works to the ‘classics’. This was certainly one for the fans – and the concert was completely sold out (the page-turner’s chair was somehow sold out from under him!). The station will showcase three emerging composers at next week’s International Rostrum of Composers in Sicily.